When Kimberley Spears started reading, she knew she wanted to share her love of books with everyone around her. She realized that not everyone in her community had financial access to a library card to a neighboring community and Sidney did not have their own library unless you’re part of the school. She saw an online idea of a little lending library and decided this was her way to share books with her community. This idea fueled her Silver Award project for Girl Scouts which is a project that will have a lasting impact on the community. The project must be approved by the Girl Scouts of Maine and demonstrate management of community resources, logging 50 hours of community service. Kim’s project was to create the Sidney Free Library for her community and hold twice-monthly story times. 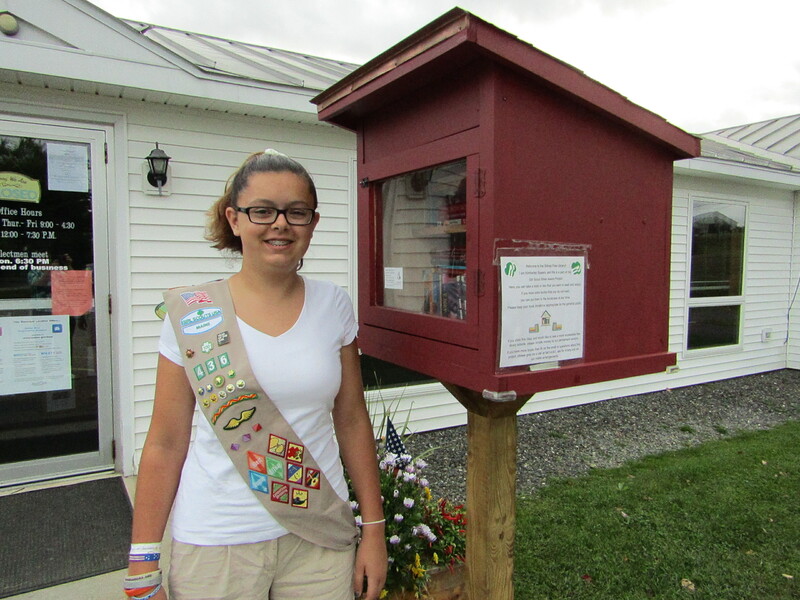 As a way to earn her Girl Scout Silver Award, Kim took on the many leadership roles involved in making the lending library a reality. On Saturday, Sept 29th at 2 pm, Kim will be officially unveiling her Sidney Free Library for the community. Kim will have logged over 50 hours of work and coordination to get to the ribbon-cutting ceremony. As Kim worked on her project, she improved her speaking and presentation skills, time management skills, and contract and writing skills. She met and worked with community resources learning about her town management along the way and established a lending library that will continue to exist in her community long after she leaves for college. She has established community contacts to give her Library community investment. Self-employed builder, Keith Bellefleur used reclaimed items and followed Kim’s designs while she sanded painted and weatherproofed the library before placing it at the Sidney Town Office on Middle Road. Patrick Linnehan, of Modern Woodmen of America, was the project advisor. Spears, who is a freshman at Messalonskee High School this year and belongs to Troop 436, reflected on what she had learned while earning her Silver Award. “I can do anything I set my mind to and make an influence on others too”. Kim says that she really enjoyed spending time sharing stories and craft activities with the little ones during her twice a month story times held at the Town Office on Wednesdays and she feels good that she has created this library for both the children and adults of the community. Kim said her community contact and leadership skills were put to the test. This was her first big community project and has sparked her to be more involved in other community activities. She has made important connections with community leaders and has made some good friends along the way. “I have a contact for donations and a Facebook page so people can share stories, books, ideas and keep the library active,” she said. Kim hopes to hold further storytimes for all ages and special events throughout the year to continue to inspire people’s love of literacy at the Sidney Free Library. Join her at the Sidney Town Office on Sept 29th at 2 pm to hear more about her story and see the Sidney Free Library for yourself. Take a book to inspire your own reading adventures and congratulate her for earning her Girl Scout Silver Award. Check it out on Facebook; search Sidney Free Library.